A silver effect 10"x8" (254mmx204mm) glass size box-frame, this box frame comes complete with the triple spaced mount in place, it has three spaces, the larger space (normally used for your 3d casts) is approx. 6"x4" (152mm x101mm), the second space (normally used for a photo) is approx. 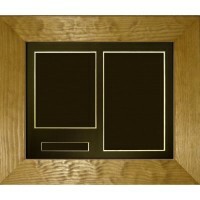 5"x4" (127mm x 101mm) and the third space is perfect for adding a name or date detail is approx. 4"x0.5" (101mmx 13mm), you simply write or print the name or date details and fix them to the back of the mount in the same way as attaching the photograph, this easily adds personalised information to your keepsake, without any extra charges. The box frame is approx. 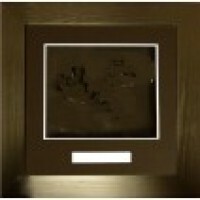 2" (50mm) deep, so this frame is perfect for a variety of different keepsakes that you may wish to display. Available with a blue/black/ivory/pink or white finish, simply choose from the drop down box to select the colour you would like your frame finished in. A solid wood, flat pine 10"x8" (254mmx204mm) glass size frame, this box frame comes complete with th..
A solid wood, black, solid wood 10"x8" (254mmx204mm) glass size frame, this box frame comes complete.. 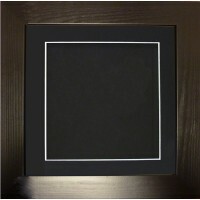 This frame is available in a black, wooden molding, the glass size is 10”x8” (255 x 204mm) and the d..
Black Frame 8x8 - Name Space Deep Box Frame only, this is a black, solid wood 8"x8" (approx. 204mmx..